It’s National Crochet Month,,, Week 2… I am so excited to be working on my next pattern to be published here on my site and on ravelry.com later this week! I live in a very small town and crochet supplies are hard to come by… I needed some new yarn to work on this project and my new pattern. This go around I was able to find what I needed for a reasonable price at amazon.com and it arrived at my home yesterday… It was so exciting to open a box and see new skeins of yarn to add to my stash! So here is to Projects, Patterns and National Crochet Month! Celebrating National Crochet Month with Free Pattern! March is National Crochet Month… There will be so much going on for people who love crochet like I do. All month-long I will be posting my original patterns for you to enjoy, talking about the history of crochet, sharing sites and links that I think are really great and spreading the word about this wonderful hobby! To kick off this celebration, I am posting my first FREE PATTERN! This is an adorable mug cozy I designed recently. I love my coffee, but not luke warm! 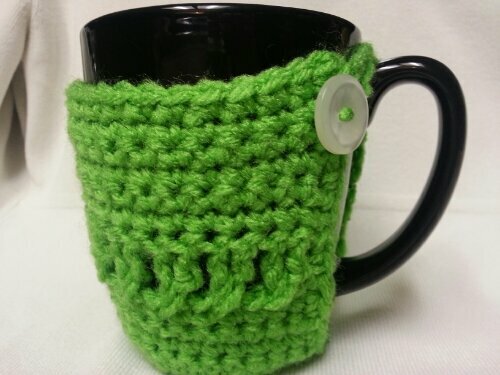 Not only do these cozy’s help keep a fresh, yummy cup of coffee warm, but they also act as a coaster… Love it! These are simple to make and take very little yarn. Great gifts too! To view the free pattern, click here or on the Pattern tab at the top of my blog. Enjoy National Crochet month with me and come back often to see new posts and patterns. 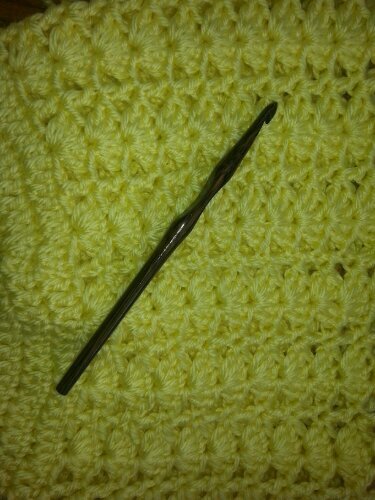 Let me know what you think… How long have you crocheted, What was your first project, Who taught you??? Post your answers in the comment section.. I would love to hear from you!! So here is to Crocheting and Celebrating National Crochet Month! So… I set aside the Sunburst Granny just for a few days and started this adorable Granny Square Baby Blanket. I have a large stash of great yarn and was able to pick a beautiful combination. This is the pattern my Grandmother Beatrice Ryan taught me at 10 years old… It has regained its popularity recently and I am blessed to have been taught this skill that will hopefully inspire many others to learn and love the Art of Crochet ! 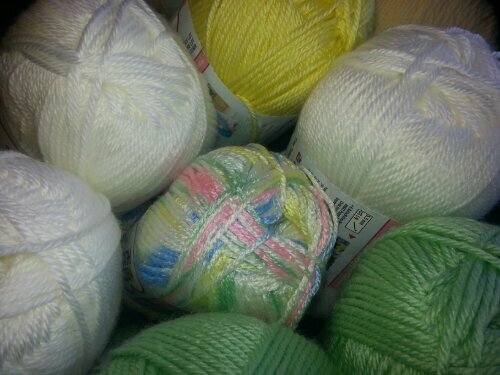 Super Soft yarn and great colors! Perfect for an adorable baby blanket! 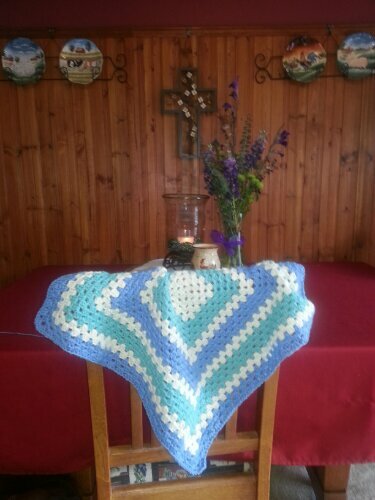 A Granny Square Baby Blanket almost complete…. I will be finishing up in the next day or so, then off to the shop! I will post a picture of the completed project… Let me know what you think!